I’m soooooo excited. Thanks to our web guru Becky, we now have a fresh, shiny new rec room for everybody who wants to come hang out and write about their projects which will never end. This is a different kind of knitalong. It’s more like group therapy. It’s a Slogalong. The genesis of the Slogalong came when I had a strong impulse to find a group of fellow knitters who, like me, were working on the Blue Sky Alpaca Silk Shrug designed by Bobbi Intveld. It’s a beautiful pattern, but really folks, it’s a 68-inch-long piece of stockinette with a ruffle. It’s not very complicated. It is, however, worked on size 4 or 3 needles. You know: a very slow roll. A slog. The more I talked to people, the more I discovered that there are plenty of folks slogging along on long-haul projects. Reeeaally long-haul projects. The projects that are hard to imagine ever ending. The kind where you go, Could there be anybody else in the world working on something that is taking as long as this? The answer, of course, is yes. Yesyesyes! Meeeeee! If you have already emailed me to join, yet your name is not showing up in the Slogalong’s list of Masochists, please email me again. Very sorry–my cat seems to have eaten a bunch of email . . . If you’re blogging your slogs on your own blog, you can leave a link on the Slogalong so we can come take a peek. At the Slogalong, no one slogs alone. Wishing everybody knitting that never ends. You are slogging right along, though. How many inches have you done? Is that today’s tongue twister? Perhaps a mantra to repeat to oneself while slogging (or blogging, for that matter)? Oh. Is there a therapy group for those who think they should join but don’t want to admit they should join, because this thing is going to be done anytime now, really, it’s just not just quite yet, and is more than a year on one project really forever? I’m on my way over. Will there be a reserved section for those with ever-growing shawls? I like to think of them akin to large-breed puppies. Cute and playful grows quickly into lots of neediness. Can moderne count, I keep picking it up, doing a few rows and then putting it down for some other UFO. I have two kids under 3 years old so right now any project I start feels like a slog project. 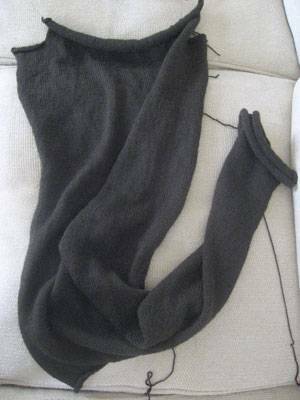 A pair of socks that used to take me a week to make takes over a month. I hate to buy yarn because I know it will sit looking at me, waiting to be used. My mind races at night thinking about the projects I would like to work on next. I was always a couple projects behind my expectations now I’m at least 20 behind. I am typing this instead of just knitting. Guilt! Hey–you got a cat? Mazel tov, buddy! Can you join the slogalong if you absolutely love large unwieldy projects and never whine even a little peep of whining about them? OK, so it was my cat who departed this earth last July. But still, I think my cat ate those emails. Clif is agitating for a fish today. I don’t think fish know how to operate a computer, so I’m game. As for your role in the Slogalong, I thought you got my message in which we informed you that you have been named Patron Saint of Cumbersome Handknits. You’re our role model, O Lady of the Patient Hands. If you join the Slogalong, you will provide untold comfort and succor to those of us who just . . . can’t . . . keep . . . going . . . I see that my question was answered in the FAQs (Freakin’-ly Asked Questions). Ooo, that sounds like something I should join. I should probably find my knitting first, though. What a neat idea. Looks like you are slogging along pretty well. Did I tell you about the Clapotis I’m working on? Slog does not begin to describe it. Count me in! Now that I’ve seen that photo of a cup of Dutch Bros – my homebrewed fuel seems soooooo unsatisfactory. I so miss living in Oregon…Why? Why? Why must you torment me so? Back to my homebrew and shoulder shaping. Tag your blog’s slogs “Slogalong”! Say that ten times, fast! Why do I feel an afghan coming on? Must I be actively slogging on my slog? Or could I join while on hiatus, hoping to be shamed, erm, *supported* into slogging anew? Gosh, this sounds like the sort of motivation i could use. I was just making a pact to finish a silk blend lace top by end April when it’s still lacking sleeves and there’s a lace panel band to add to the neck! A slogalong! What a great idea! I don’t feel so alone now… I’m normal, right? That’s it, yeah… normal… I have to go sign up now. I went over to the Slogalong page, and I must have a different definition of “slog” than others. “I started this three months ago…” isn’t slogging, I don’t think. “I’ve been working on this for two years” is slogging. No? Maybe it’s all relative. I know it’s not exactly germane to the slog convo, but that thing looks exactly like a Thneed. Just sayin’.